Would you like to explore your creativity in a relaxed supportive group? Come along to a six-week workshop at Time and Talents on Monday evenings 7.00-9.30pm! These sessions will suit both beginner writers and those with some experience. 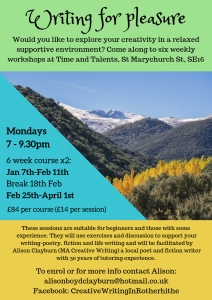 They will use exercises and discussion to support your writing: poetry, fiction and life writing, and will be facilitated by Alison Clayburn (MA Creative Writing), a local poet and fiction writer with 30 years of tutoring experience.